Most people eat popcorn or candy, but she was looking for something a little heartier. Apparently, arts and crafts skills can still come in handy. Questions will get you in trouble. "Arm? I haven't heard that name in years." Maybe I'll bring an elephant next time I go to a pet-friendly hotel. These are the ways to know that Bae is the best. If the poo fits, might as well not throw it out the window. When you go to a movie, certain snacks are considered acceptable. A hot dog, a Coke or a box of candy is generally seen as appropriate. Eating popcorn is often considered mandatory. However, David Chen of the Slashfilmcast posted this photo of someone who decided to buck conventions. Not only did she bring in her own food to a movie, but the food was an odd choice. She brought spaghetti. The photo drew a lot of attention from Twitter users who were surprised that someone actually brought spaghetti to the movies. Why should we be forced to simply follow the rules of what we are or are not supposed to eat while in the theater? Some people were reluctantly on board with her idea of eating spaghetti at the movie. If spaghetti becomes acceptable, maybe other foods will become acceptable too. The entire movie theater experience could become even better. Other people commented that her idea isn't really that crazy. Who hasn't enjoyed a fine porkchop dinner while enjoying the latest super hero movie? It's two things that go great together! On many occasions, the best time to see a movie is also the best time to eat dinner. Why force yourself to starve just so you can sit in a theater for two hours? You might as well make the most of your time and eat and watch all at once. Sure, some foods present a bit of a problem when eating them at the theater. For instance, how would you eat a cheesecake? Do yo take out a plate and fork during the movie, or just grab a handful of cheesecake and shove it in your mouth? A couple other people posted proof of doing something similar. These two went beyond spaghetti and brought fettuccine to Spider-man. Perhaps pasta and movies are becoming the new trend. Another Twitter user said that you don't even need a bag to sneak in some spaghetti. You could also sneak it into a spaghetti burrito. Sure, it's a lot of carbs, but it also sounds oddly delicious. A couple of other people pointed out that this isn't the first time someone has eaten spaghetti at a movie. It was also done by Charlie on It's Always Sunny In Philadelphia. However, he might not be the best person to site as a positive example. In case their was any doubt about the photo's accuracy, another Twitter said he knew the woman in question. 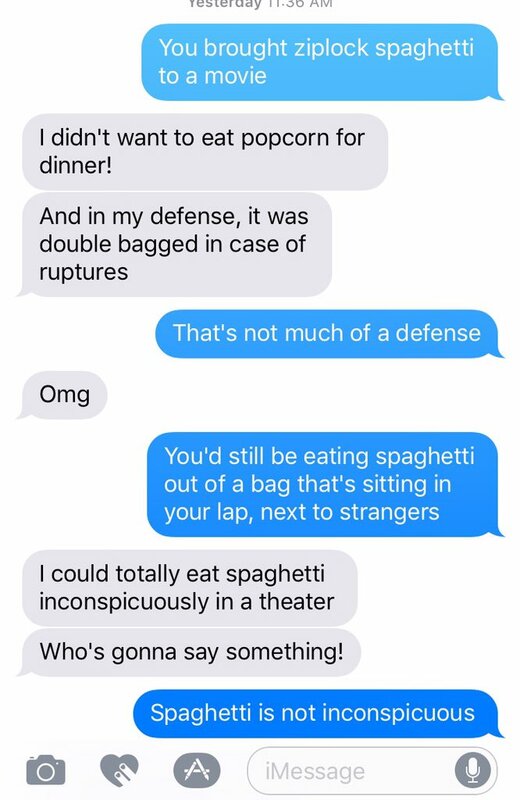 And he could prove that the spaghetti incident really happened by sharing these text messages. However, the person she was texting did not seem to approve. 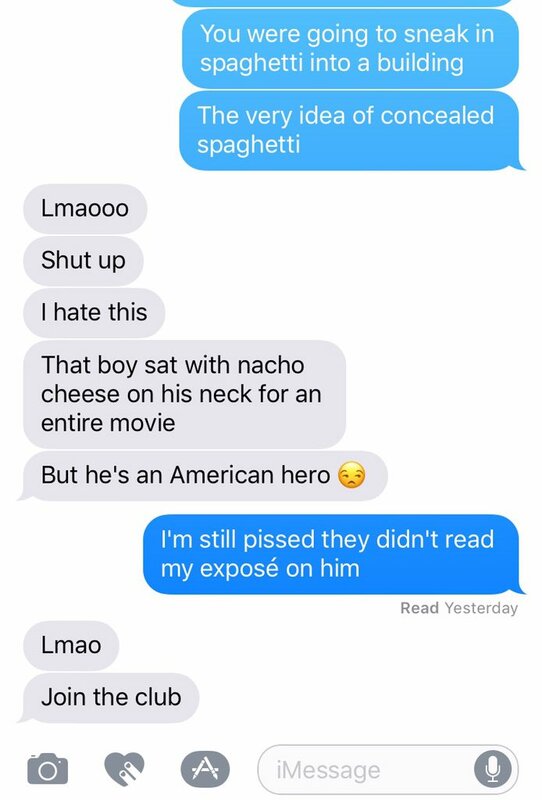 Her friend was definitely giving her a hard time about the spaghetti. But clearly, she brought it anyway. But was it really the right thing? Other people disapproved of the spaghetti bags as well. This person even said they wouldn't even hang out with someone who brought that to a movie. For some people, this is a very serious issue. However, someone pointed out that there's worse things to bring than spaghetti. Spaghetti may be messy, but it's not nearly as bad as chewing tobacco. Sometimes you have to count your blessings. In the photo, there's no indication that she brought any forks with her. But we have to assume she had them on her person somewhere. And as long as she did, she should be saluted for broadening the horizons of what's acceptable food at the movies.